The average yearly income of €15,900 and the average household income of €25,200 in 2010 are low, and in 2012 a quarter of households earned the social minimum, with 34% of youth living in such households. The educational level of the area has 48% low educated and 16% highly educated. Slotermeer-Noordoost has a large number of non-Western migrants, forming 64% of the local population. The largest ethnic groups are Moroccans at 27% and Turks at 19%. For a more detailed breakdown of the figures, please see the section “Slotermeer-Noordoost in numbers” below. 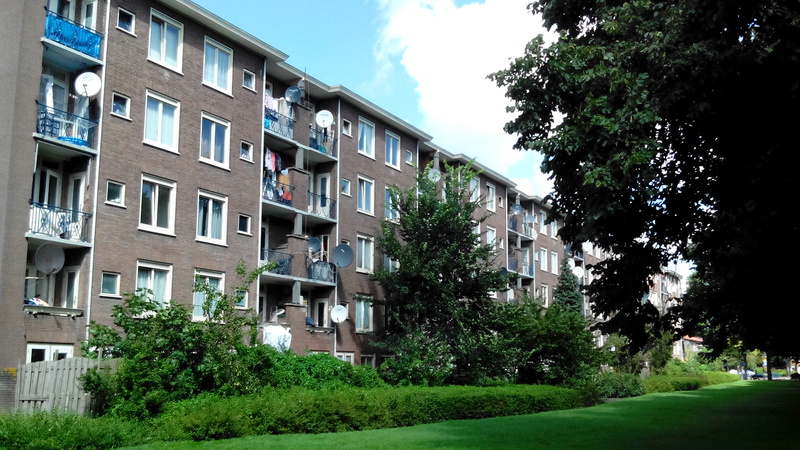 As with the other case study areas, Slotermeer-Noordoost has a high proportion of social housing at 68% of the whole neighbourhood. A further 26% is owner-occupied and 6% is privately rented. The housing stock was largely built in the period immediately after the Second World War, from 1946-1960. The average house has 3.1 rooms and a value much lower than the city average. Apartments tend to be in buildings with four to six stories, but some have as many as ten. The architecture tends to be quite monotonous and of relatively low quality. In 1998, renovation works began in the area and were due to take 15 years. However, they were subsequently put on hold (and in some cases cancelled completely) due to the economic crisis. The graphics show the concentrations of the three largest ethnic groups in Slotermeer-Noordoost and confirm that the neighbourhood is dominated by Mediterranean guest-worker migrants. Location of Slotermeer-Nordoost in Amsterdam and relative to the other two case study neighbourhoods. Map of neighbourhood combination Slotermeer-Noordoost: the neighbourhood detailed in the spreadsheet (Buurt 3) is located in the upper half of the map. Concentrations (>2sd above city average) of mainly Moroccans (yellow) and Turkish (red) but also Surinamese (dark blue, two concentrations), other non-Western ethnicities (pink), and Western non-Dutch ethnicities (light blue).